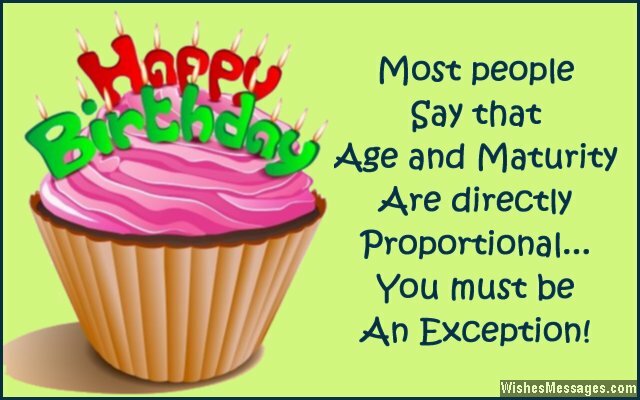 Funny Birthday Wishes: From humorous quotes about getting old to banter about wrinkles and maturity, this post is a notoriously funny hot pot of birthday messages. 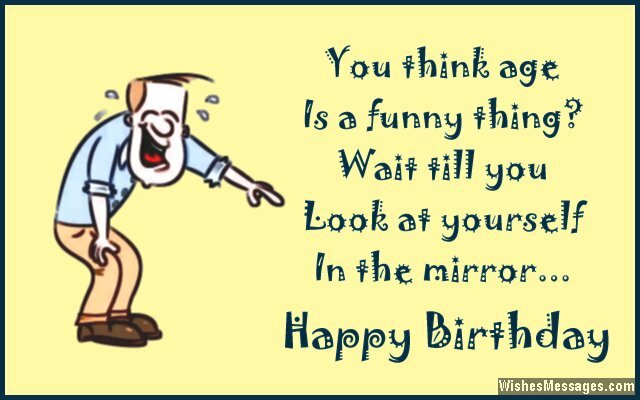 Whether it is your best friend, girlfriend, boyfriend, boss, colleague, mom or dad – their birthday is your chance to get under their skin with jokes. Make fun of them as you raise a toast. Give a speech that leaves everyone in fits of laughter. Keep it clean and don’t forget to douse the insults with cute one-liners that make up for all the crazy things you’ve said. Top it off with a gift that brings back that sweet smile on their face. 1) When I look at you, I can’t think of the worst part of getting older – because everything about it seems equally bad. Happy birthday. 2) OLD is an abbreviation for Obsolete, Lazy and Dull. Congratulations for turning one year OLDer. 3) Some people may tell you that age has added grace and maturity to your looks. That’s just a nice way of saying that you have become old and boring. Happy birthday. 4) Age is a funny thing because it adds years to your life, and also subtracts years from your life. Whichever way, it is never good news. Happy birthday. 5) Friendship is all about give and take. You can take the gift I got for you ONLY if you give an awesome party in return. Happy birthday. 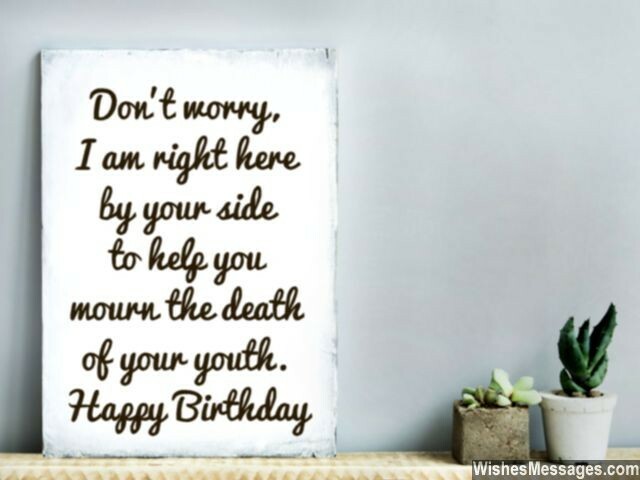 6) Don’t worry, I am right here by your side to help you mourn the death of your youth. Happy birthday. 7) It is amazing to see what a big difference one year can make in a person’s life. Last year, you were stupid and this year you have suddenly turned stupider. Congratulations and happy birthday. 8) On your birthday don’t forget to set goals that are sky high, and spend the rest of the year miserably trying to build a rocket to get there. Happy birthday. 9) Getting someone as awesome as me to send a birthday message to you, has undoubtedly been your biggest achievement this year. Happy birthday. 10) The true meaning of our friendship is that we can celebrate your birthday even if you are broke and you can be happy even if friends don’t have enough money to buy you a gift. Happy birthday. 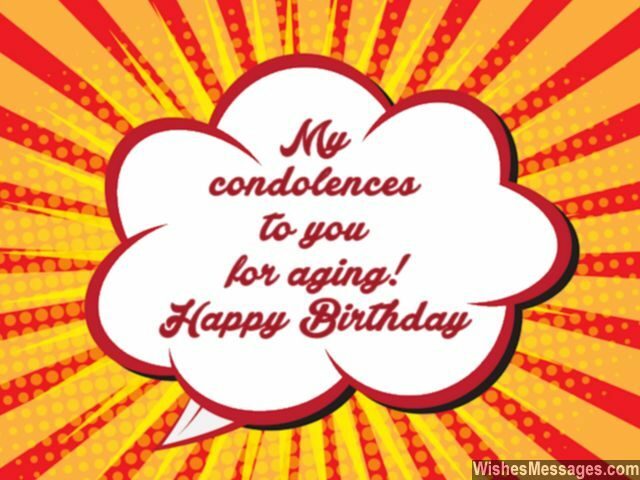 11) My condolences to you for aging. Happy birthday. 12) The wrinkles on your face say that you are old, your maturity levels say that you are a teenager while your birth certificate says something completely different. What should I trust? Happy birthday. 13) Did you just turn a year older? I feel your pain, I really do. But don’t worry because we are all in this boat called Life together. Happy birthday. 14) I would give you a trip to the moon and a holiday to an exotic island as your birthday gift. I only wish you returned the money you owe me first. Happy birthday. 15) I got you the most expensive and luxurious anti-aging beauty gift hamper. Use it well, you will need it. Happy birthday. 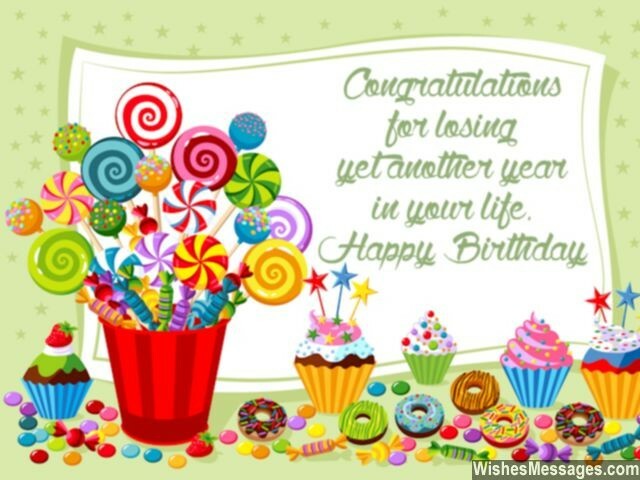 16) Congratulations for losing yet another year in your life. Happy birthday. 17) The ability to take better decisions and showing a heightened sense of responsibility are some of the typical traits of maturity – except in cases like yours. Happy birthday. 18) Age adds wrinkles and subtracts fun. Age multiplies problems and divides life’s simplicity. Happy birthday and good luck. 19) Birthdays will come and go, but your youth is lost forever. Happy birthday. 20) As your best friend, I’ll save you from all the problems that life throws at you except one – getting old. Don’t believe me? Take a look in the mirror. Happy birthday. 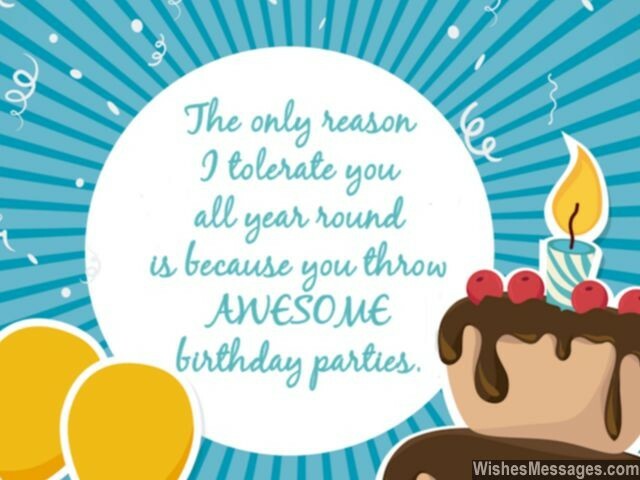 21) The only reason I tolerate you all year round, is because you throw awesome birthday parties. Happy birthday. 22) I always limit my budget on buying birthday gifts according to what that person gave me as a gift on my birthday. Guess who is getting a cheap gift this year? Happy birthday mate. 23) All your birthday parties will also be meaningless if you don’t have friends like me to enjoy them. Happy birthday and thanks for the invite. 24) In your birthday gift I have slipped a few phone numbers of beauty and skin specialists. Maybe you will need their services. Happy birthday. 25) I hate most social norms so I did not get you a birthday gift. But the only social norm that I don’t mind is attending birthday parties. Happy birthday. 26) You think age is a funny thing? Wait till you look at yourself in the mirror. Happy birthday. 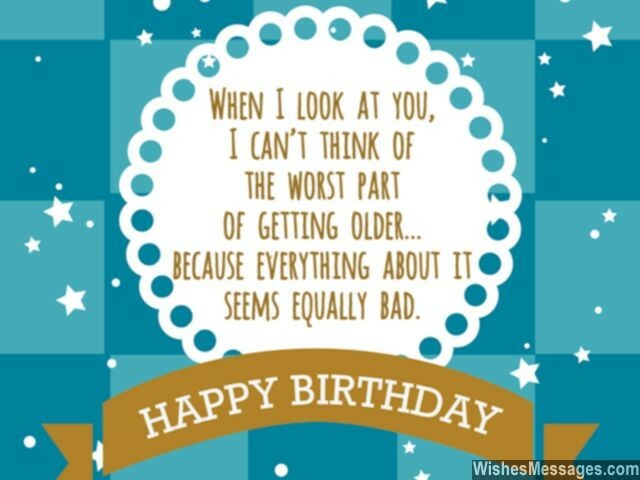 27) I wish I could make fun of you on your birthday about your age. But with each passing year, I am getting older too. Happy birthday. 28) Best friends never lie to each other and I must be honest with you. Damn, you’re getting old. Happy birthday. 29) ‘Aging gracefully’ is just a reassurance to heal the pain of looking at wrinkles on your skin. Happy birthday. 30) If you get old so fast, no one will believe that we are friends, so slow down. Happy birthday. 31) Most people say that age and maturity are directly proportional. You must be an exception. Happy birthday. 32) A lot of people will come and go in your life, but good friends like me will stay forever. On that note, you must also know that birthdays come go, but your age will keep increasing forever. Happy birthday. 33) We look forward to celebrating your birthday by going out and having a lot of fun. Do you know why? Because you’re paying. Happy birthday. 34) On your birthday I want to wish you success, wealth and fame so you can give us expensive gifts and invite us to luxurious parties. Happy birthday mate. 35) Don’t be too happy about the many candles on your cake. They just signify that you’re getting older. Happy birthday. 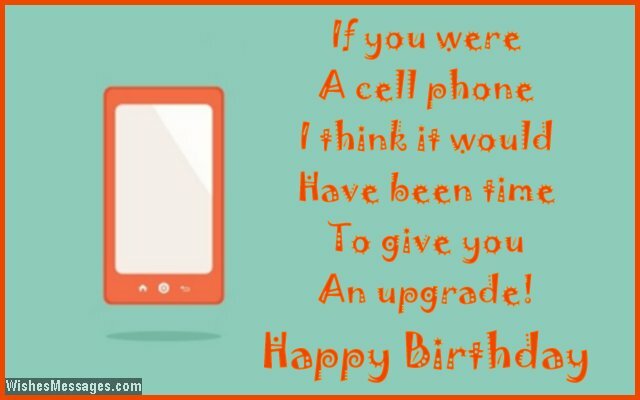 36) If you were a cell phone, I think it would have been time to give you an upgrade. Happy birthday. 37) It is believed that as people turn older, they tend to get choosier and pickier. That is why I played it safe and got you an Amazon gift card so you can satiate your idiosyncrasies and buy something that you really want. Happy birthday. 38) The only cool thing about turning older is that you can claim to be mature, even though you are not. Happy birthday. 39) Adding yet another year to your age is probably the worst thing that has happened in your life so far. And guess what, it will keep happening again and again, and again. Good luck, happy birthday. 40) On your birthday today let’s pray together and hope that a genius scientist invents a machine that reverses ageing. Happy birthday.